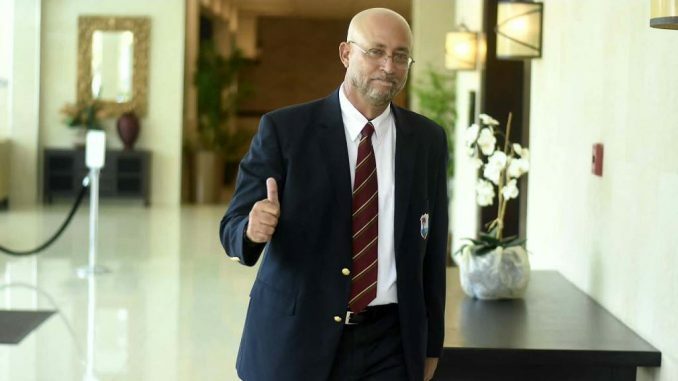 Basseterre, St Kitts, March 24, 2019 – Newly elected president of West Indies Cricket, Richard “Ricky” Skerritt has pledged to improve the sport on and off the field and is humbled by his election on Sunday. The Skerritt-Shallow ticket brought an end to the reign of Whyclife “Dave” Cameron as president of Cricket West Indies (CWI). Skerritt, a for­mer St Kitts and Nevis cab­i­net min­is­ter, will assume the role of president with his slate winning the voting process by eight votes to four. His running mate, Dr Kishore Shallow will displace Dominica’s Emmanuel Nathan as vice-president, bringing to an end Cameron’s six-year and very controversial tenure. Prior to Sunday’s elections, Cameron made it clear his team was confident on yet another win and they didn’t need to campaign to secure a fourth term. According to Renaldo Matadeen of Trinidad it was said that the Wind­ward Is­lands, Bar­ba­dos and Guyana boards al­ready pledged their two votes to the Cameron tick­et which gifted his regime six of the sev­en votes re­quired to win the elec­tions. Trinidad and To­ba­go and the Lee­ward Is­lands pledged to the Skerritt slate, while Jamaica was undecided, which meant there were indeed surprise swing votes that helped depose Cameron. Skerritt’s campaign was built on repairing player relations and improving the economic status of the game regionally, which has clearly paid dividends with former star players such as Sir Viv Richards, Darren Sammy, Roger Harper, Deryck Murray, Clive Lloyd and Sir Andy Roberts backing his vision. SKN: Criminals On Government Payroll?